Living Plaza – Dallas, TX from Aaron Garcia on Vimeo. “Ultimately, Holly White’s studies outline simple and inexpensive solutions that have a big impact on the creation of humane, active, and lively places. When you break it down, it’s all intuitive stuff like ‘bring chairs,’ ‘create shade,’ ‘add food,’ but we seem to overlook these time and again and pursue bigger ticket items that don’t have an impact on day to day life,” Jason Roberts. The living plaza project continues next week and into the summer thanks to dedicated City staff members. Check it out next Wednesday and for more details see the Dallas Observer article. 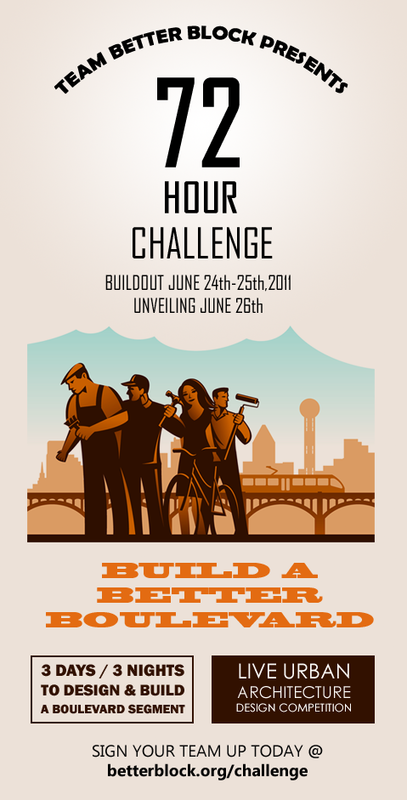 Donate to support teams for the challenge through the North Texas Congress for New Urbanism.